It was little more than a decade ago that farmer Matthew Parker sat in a ROPS-frame tractor, towing a Jetstream boom sprayer, copping spray drift in the face and enduring headaches while transferring Treflan to the spray tank. Now he sits in an air-conditioned and chemical spray-protected cab, watching proceedings while his “automatic” self-propelled Croplands Equipment RoGator boom sprayer cruises around the paddock, day or night. Matthew and his brother Sam, who crop a 6500ha enterprise at Tutye, 85km east of Ouyen in Victoria’s Mallee country, are among a growing band of farmers switching to SP sprayers and relevant precision farming technology to push productivity parameters. The combination of sprayer and technology also is a potent force in reducing inputs costs, while enhancing the ability to lift crop yields. This is the reason why Croplands and Topcon are committed to supporting the Australian ag industry from the ground up. This win-win scenario is why Matthew and Sam started on the technology road six years ago, with thoughts of getting spraying programmes completed quickly, particularly during small windows of opportunity after summer rain. Out went the tractor-drawn sprayer in favour of a Hino truck with a 3000L Croplands tank on the tray, towing a Jen-Ell boom sprayer, boasting an 80 foot cable suspended boom. The brothers then progressed to a MAN truck, tweaking technology a little further with an integrated mounted 5000L tank and a 100ft boom. And, as notification of their intent to follow technology, they bought a then KEE X10 spray controller, to monitor the spraying system, complete with visual guidance. The move, according to Matthew, practically quadrupled spraying opportunities as it introduced them to night spraying and a wider spraying window. “Before the X10 we were lucky to get one tank of spray out in the morning as we juggled between high temperature and relative humidity, and the rest of the day was dictated by the wind and delta T,” said Parker. After 18 months, the brothers bought a used 1264 RoGator with only 300 hours on the clock and they matched that with a TopCon X15 controller with a HP signal that provided them with sub 10cm accuracy. 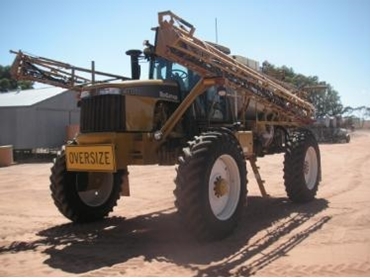 But with two brothers and a big spraying programme, it soon became evident that two RoGator boom sprayers could do an ever better job on the farm. The brothers added a 1274 RoGator boom sprayer to the farm inventory complete with a TopCon X20 controller that provided auto guidance, auto boom shutoff, auto boom level, automatic rate control and the ability to interface with Topcon’s MAPLINK program, which uses coloured maps to control the chemical rate. The X20 also automatically logs the application data, maps and details of each job enabling recording of the precision application of seed, fertiliser and chemicals. Topcon also has developed a simple calculator which demonstrates the potential savings and increased revenue possibilities of using variable rate control. Last year, the brothers traded the 1264 on Cropland’s latest RoGator boom sprayer, the 1286C, also equipped with a Topcon X20 controller. It boasts a front-mounted 8.8L Caterpillar C9 electronically-controlled engine with 232kW engine power rising to 251kW with an eight per cent power bulge. The power bulge takes effect immediately the machine drops below rated revs, and with direct plumbing from the hydrostat to the wheel motors, power transfer is maintained without surging, leading to longer wear life of the wheel motors. The Sampo radial piston wheel motors are directly mounted to all four corners offering full-time four-wheel drive with the Sauer Danfoss hydrostat transmission driving the wheel motors in an X pattern. This ensures that if one wheel breaks traction, at least two are still driving, which is a great innovation on hilly country when grunt and traction are needed. The six-speed range transmission also allows multiple on-the-go gear selection to match operating speed. “The RoGator boom sprayers are super machines because they are very reliable, the boom is not too heavy, plumbing is simple and basically it’s a no-fuss operation. When you combine it with the Topcon controller, it’s a package we know is good for our bottom line," said Parker.